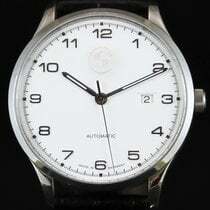 Junghans is a German company with a long tradition. They combine classic watchmaking with modern technology. This luxury watch manufacturer's catalog includes everything from Bauhaus-inspired automatic watches to radio-controlled quartz timepieces. 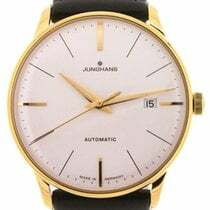 Junghans is one of Germany's most famous and storied watch manufacturers and was once the largest watchmaker in the world. Based in the southwestern town of Schramberg, this company is best known for its pioneering role in the development of radio and solar-powered watches . These high-tech timepieces remain an important pillar of Junghans' catalog today and are recognizable by the word "MEGA" in their name. 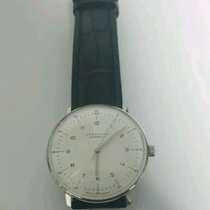 That being said, Junghans also produces a wide range of high-quality mechanical wristwatches. Perhaps their most famous collection is the Max Bill. Named after their Bauhaus-educated designer, these watches epitomize the school's teachings. They're elegantly simple and functional. The Form and Meister collections also feature understated designs but with a sporty twist. The watches of the Pilot and Driver collections give off a retro feel. As their names suggest, the Pilot collection takes its design from classic pilot's chronographs and the Driver series is inspired by racing car cockpits. 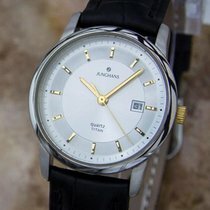 How much do Junghans watches cost? Simplicity, elegance, and perfect readability define the Max Bill collection. Max Bill was a Swiss architect, painter, and artist who studied at the Bauhaus in Dessau, Germany in the late 1920s. This highly influential school of art in Germany was only around for the period between the two World Wars, but its impact continues to be felt to this day.In 1956, Junghans commissioned Bill to design a kitchen clock. This was followed five years later by the first Max Bill wristwatch. Its design remains almost entirely unchanged to this day . Thin lines serve as indices, joined by simple Arabic numerals that almost seem a bit dry at first. However, upon closer inspection, you realize how much detail went into each individual numeral. The "4" is especially eye-catching. The 38-mm stainless steel model without any numerals is even more understated. With an automatic caliber, this timepiece sells for between 800 and 900 USD. Quartz-powered models tend to cost around 340 USD less. They say you can't teach an old dog new tricks, but that's not the case with the Max Bill. The Max Bill MEGA is a modern take on this classic watch, using Junghans' own state-of-the-art radio technology. The only thing about the outside of this timepiece that distinguishes it from its mechanical sister models is the addition of a "MEGA" inscription. However, inside lies a high-precision multi-frequency radio-controlled movement. This means the Max Bill MEGA will always show the correct time no matter where in the world you are. Prices for this high-tech watch sit around 760 USD. 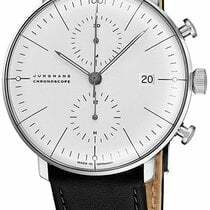 The Max Bill is also available as a chronograph, which Junghans refers to as a "Chronoscope." At 40 mm, its case is somewhat larger than that of the three-hand model. The automatic caliber J880.2, based on the proven ETA Valjoux 7750, ticks away on the inside. This movement provides the watch with its 30-minute counter at 12 o'clock and a 12-hour counter at 6. There's also a date display at 3 o'clock. Plan to spend anywhere from 1,400 to 1,600 USD for one of these beautiful chronographs. The Form collection contains four basic models: the automatic three-hand Form A, the Form C with a quartz chronograph movement, the quartz-powered Form Quarz, and the women's Form Damen. Bauhaus design also had an influence on this collection, though Form watches also feel a bit sportier thanks to their embossed minute scales. The quartz models are the most affordable. Both the Form Quarz and the Form Damen cost around 400 USD. At 420 to 460 USD, the Form C costs only slightly more. You'll have to dig a bit deeper in your pockets for the automatic Form A, which demands anywhere from 780 to 920 USD. The Meister collection has a long history at Junghans. This watch manufacturer has been producing watches with especially high-quality movements under this name since the 1930s. The current series pays homage to this era. A majority of these timepieces feature mechanical movements based on calibers from ETA, ETA-Valjoux, or Soprod. Junghans produces these watches with a wide variety of complications, including a moon phase indicator, chronograph, day/date display, and power reserve display. There are even extremely precise, chronometer-certified versions available. Prices for standard editions range from around 1,100 USD for a simple three-hand watch to just under 1,600 USD for a chronometer model. Plan to spend about 2,200 USD for the special edition Meister Chronoscope Terrassenbau. The Meister MEGA is unlike any other watch in the Meister collection. The radio-controlled J101.65 movement powers this state-of-the-art timepiece and can search for time signals across five frequencies. Once the watch has found a signal, it will only deviate by a maximum of 0.02 seconds per year. Even if its reception is interrupted, the Meister MEGA still has a maximum annual deviation of only eight seconds. Set aside between 850 and 1,100 USD for this timepiece. Both the Meister Pilot and Meister Driver collections take the term "retro" to heart. The Meister Pilot is an automatic pilot's chronograph that bears a strong resemblance to the model created for the newly-formed West German military in 1955. Even back then, the design's inspiration came from the instruments inside a plane's cockpit. A clean layout and luminous numerals and hands lend this timepiece its outstanding readability. The distinctive 12-sided rotating bezel is easy to operate and is another borrowing from the original 1950s model. The modern Meister Pilot demands around 2,200 USD. Junghans designed the Meister Driver collection with speedometers and r.p.m. counters from classic cars in mind. Even the beige, light brown, gray, or turquoise leather straps are modeled after the interiors of these legendary vehicles. Fittingly, each timepiece features a mechanical caliber. You can choose from an automatic or a manual movement, as well as if you'd like a chronograph function or day/date display. Depending on the model, the Meister Diver sells for between 930 and 1,800 USD. If you prefer more modern timepieces, the Radio Control & Solar collection is right for you. Here you'll find watches outfitted with the latest in radio and solar technology, state-of-the-art materials like ceramic, and modern sporty designs. Each model pairs a standard analog time display with a digital date display. The sportiest model is the 41.6-mm Spektrum Mega Solar. Made of a mix of stainless steel and ceramic, this timepiece features a radio-controlled solar movement from the current generation. When left unexposed to light, it will still work for up to 21 months. You'll find this same movement in the Milano Mega Solar and Force Mega Solar models. While the Milano has a stainless steel case, the case and bracelet of the Force are exclusively ceramic. The prices reflect the material used: You can purchase a Milano for around 320 to 530 USD, the Spektrum for about 940 USD, and the Force for just under 1,300 USD. The 1972 Chronoscope Solar and 1972 Chronoscope Quartz are truly unique. Their designs were inspired by the stopwatches used at the Munich Olympics in 1972, where Junghans was the official timekeeper. Both watches are able to measure times to within a fifth of a second and feature a unidirectional bezel. The Solar edition has an additional alarm function, while the Quartz model comes with a 24-hour display. Prices for these timepieces sit at around 660 and 510 USD, respectively. 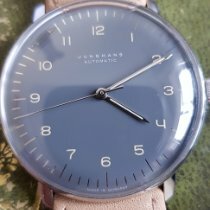 Junghans' history begins in 1861 when Erhard and Xaver Junghans founded the company in the southwestern German town of Schramberg. At first, they primarily produced components for the region's other watch manufacturers. It wasn't until 1866 that they began to make their own movements. The company's first major success was in the production of alarm clocks, which they started doing in 1870. However, the transition to manufacturing pocket watches didn't come easy. It took until 1890 and a merger with Thomas Heller AG for any real progress to be made. From there, Junghans grew and grew, eventually becoming the world's largest watch manufacturer in 1903. At that time, Junghans employed over 3,000 people and was producing over three million watches a year. They began producing wristwatches in 1928, outfitting them with movements from Ruhla, another watchmaking town in central Germany. Junghans released their first watch with an in-house caliber in 1930. During the Second World War, Junghans shifted their focus to making onboard instruments for airplanes, as well as detonators and other armaments. They returned to watchmaking after the war ended. By the mid-1950s, they had become the third largest producer of chronometers behind Rolex and Omega. Even a hostile takeover by Diehl, a company from Nuremberg in southern Germany, in 1956 couldn't stop the success of Junghans watches. In fact, the opposite is true: The subsequent release of the Max Bill collection and their first automatic chronometer caliber, the J83, marked major milestones in their history. In the early 1960s, Junghans was paying ever more attention to quartz watches. They went on to release the quartz-powered Astro-Chron table clock in 1967. Three years later, the watch manufacturer released the first German quartz wristwatch : the Astro-Quartz. Since then, Junghans has continued its pioneering ways. They were the first to create a radio-controlled wristwatch, known as the MEGA 1. They later combined radio with solar power in the Mega Ceramic Solar, another first of its kind. The company's watch department was sold to Egana Goldpfeil Holdings Ltd. in 2000 and was on the brink of bankruptcy only eight years later. However, the company has set itself back on the right track since it was purchased by Schramberg's Steim family in 2009.